Theatre G.B. 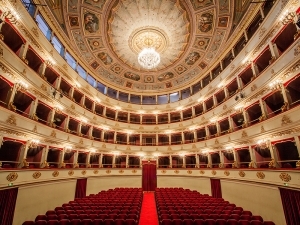 Pergolesi, center of cultural life of Jesi, is qualified by the 1968 Ministerial Decree *, as one of 29 of Tradition Theatres (only example in Italy in a city not provincial), as its strong local roots institution, qualified to level national for an opera production of great prestige and artistic quality, and charged with the responsibility of promoting and coordinating the lyrical-musical activities within the province. Teatro Pergolesi qualifies for the continuity of opera production, for the protection of musical tradition, for the development of innovative languages and the promotion of young artists.